You may want to print this page for reference before proceeding. Login in to your account. If you haven't done so before, or need assistance, click here. How do you want your name to appear as a signature to letters? 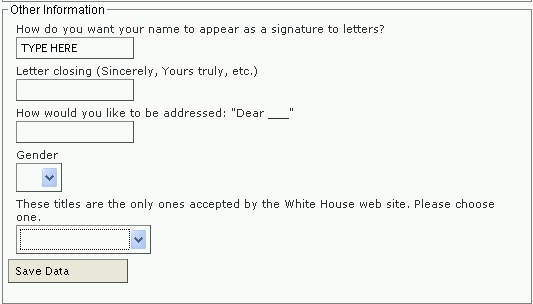 = What name would you like us to use when sending letters to Congress and the President. Many people use their first and last names, and a middle initial. If 2 people are signing the letter, use both names. For example: Mr. and Mrs. John Doe OR John and Jane Doe OR John Doe and Raymond Roe.